If you have any particular personalised design in mind which you want to make and can't find anywhere else, let us know we will create a CAD design for you and will get back to you with the quote of that particular design. It is almost a diamond. Item must be in its original unworn condition. Color can be slightly different due to reflection of light in the picture. Item must not have been sized or customized in any way. Pictures 7 And 8 Have Loupe Light Upon. It will not look like a piece of rock salt, like cubic zirconia, after two weeks. 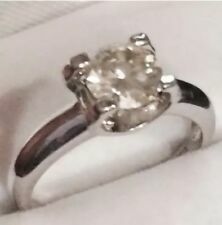 Very cute champagne color shade round cut Moissanite 1 ct about 6.5mm Sterling silver ring hardness 9.25 on a MOHs scale test like diamond on a presidium diamond tester! LOVELY COLOR: LIGHT CHAMPAGNE. 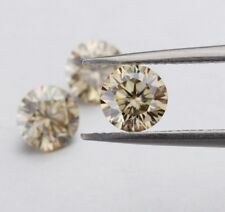 HUGE: 9.40CT 13.95MM. VS-SI IN CLARITY. VERY SPARKLY. Their chemical components are different, although they look similar from appearance. Yes, we can. As we told before that we have our own factory. We are professional gemstones manufacturer with 10 years experience in loose gemstones production. They are visually identical to natural-grown stones but cost much less to produce and to buy. Cubic Zirconia is made of zirconium oxide (ZrO2 ). LIMITED QUANTITY! Won't chip, fade or cloud. Harder than other gems. A HOT NEW TREND and a diamond alternative at a TENTH of the price! Average Color: Champagne. Stone Shape: Round. Average Clarity. A HOT NEW TREND and a diamond alternative at a TENTH of the price! White Gold / Yellow Gold / Rose Gold. 925 Silver / 950 Platinum. make a similar jewelry for you then we can do that for you. · White Gold / Yellow Gold / Rose Gold. · 925 Silver / 950 Platinum. make a similar jewelry for you then we can do that for you. It will not look like a piece of rock salt, like cubic zirconia, after two weeks. You’ll be getting the actual item as photo. Colour may notappear exactly as in real life due to variation between computer screenresolution & lights. Greatquality for making Necklace, Earrings, Bracelet or any other jewelry. It is almost a diamond. Item must be in its original unworn condition. Item must not have been sized or customized in any way. ALL PAPERS and gift box must be included and in new condition.